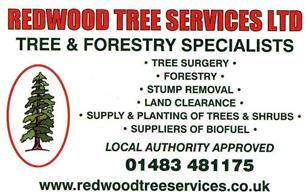 Redwood Tree Services Ltd - Garden Services, Tree Surgeon based in Woking, Surrey. Invoice history based on 189 reviews. Redwood Tree Services was founded in 1985, now in its thirty second year of trading and still providing high quality workmanship and customer satisfaction to all our clients. We are extensively equipped to carry out all tree surgery and forestry/ site clearance operations. We use Aspen petrol and oils in our chainsaw and hedging equipment, this is a more environment friendly fuel which produces a lot less harmful emissions. All team members are trained to NPTC standard both climbers are qualified Arborists , we have a rolling training program in place where we promote personal development for each and every one of our workers. This helps with keeping up with new techniques and health and safety requirements. Nick Rose, Dip.Arb lvl 4 , M.D , has extensive knowledge of both the Forestry and Arboriculture industries working in both for approximately 28yrs as well as being a qualified Arboriculture consultant also has numerous NPTC certificates for various operations both in tree surgery and forestry, is most qualified to deal with any situation. We cover every element of the tree work industry, from tree planting to large crane tree removals. No matter how Big or small your requirements are we guarantee to provide you with a highly professional service.